Penrite Enduro 25w70 classic motorcycle engine oil is a premium high performance mineral, SAE25w70, high zinc, non-friction modified 4-stroke engine oil. 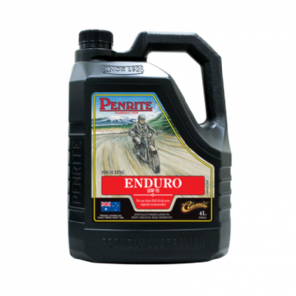 It contains a superior anti wear package of FULL ZINC (exceeding 1750+ ppm levels) for ultimate engine, gearbox and clutch protection and a multigrade viscosity designed to maintain oil pressure and consumption control for older and classic motorcycles. Recommended for use in pre 1980 motorcycle engines where SAE40 and SAE50 grade engine oils were specified. it is also equally suitable for use in transmissions with wet clutch systems where engine and gearbox oils are combined. It is ideal for many classic motorcycles such as Ariel, BMW, BSA, Ducati, Indian, ISO, JAWA, Matchless, Moto-Guzzi, Norton, NSU, Royal Enfield, Sunbeam, Triumph, Velocette and Vincent. Can also be used in older worn engines or those burning excessive oil that originally specified SAE30 or SAE20w50 grade engine oils. Health, Safety and the Environment: Prolonged and repeated contact with used engine oil may cause skin cancer. Avoid skin contact with used oil. Wear suitable gloves. After contact with skin, wash immediately with soap and water. Do not pollute drains, soil or water with used oil. Protect the invironment by disposing of used oil properly. NOTE: This pack is not suitable for use as a fuel or solvent container. If the seal is broken return to place of purchase. Penrite will not guarantee this product if the tamper seal is broken or supplementary additives are used.